I awoke yesterday morning to an eagle’s cry. “Are you still asleep?” I asked my wife. Her eyes opened a crack, and I said, “It’s the eagle. I can hear it.” She lifted her head from the pillow to listen, and the eagle cried again. We both rolled out of bed and pulled on our swimsuits. It was 6:20. The wind was nearly still, and the lake was the quietest it had been this trip. The air was cool but weighted with a touch of humidity. I got to the beach first and high-stepped into the water until it was up to my waist, far enough out to see the eagle if it was perched in its usual tree, a towering hemlock just south of the camp property. The eagle wasn’t there, but a moment later, it glided overhead, wings held wide as it flew south and then banked eastward around the point. My wife arrived after it had gone, and when I told her where it was headed, she set out that way with a strong crawl stroke. She went perhaps a hundred yards and then switched to backstroke so she could look up at the trees as she swam. Soon, she rounded the point and went out of sight. I used to worry when she swam far away, alone in open water, but she’s a powerful, relaxed swimmer, and my anxiety has faded over the years. 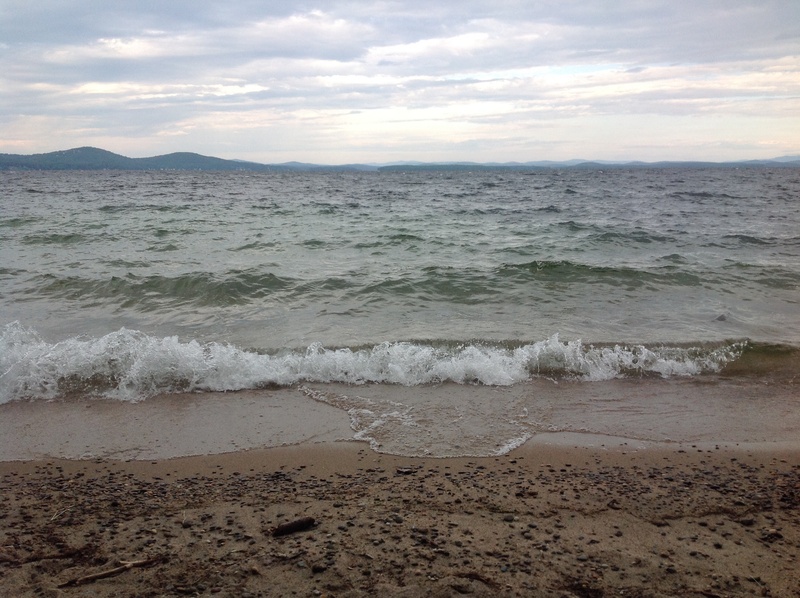 I swam up and down the length of the beach for a little while and then stood in the water, looking across the lake. A fog bank had settled over the low hills. Though it appeared static from where I was, I imagined being up close and watching it creep over the peaks and down their slopes, a slow, vaporous waterfall. I returned to the tent to dress, and my wife joined me perhaps fifteen minutes later. Swimming around the point, she had seen two eagles in flight, and she thought at least one of them may have come back toward camp. I went outside, and pretty soon, I heard the same, plaintive cry that had awakened me. I couldn’t see the eagle, though I could hear that it was high in a tree nearby. Then the cry changed to a gentler, chittering call, and I looked up to see another eagle glide toward where the call had originated. It was as if the perched eagle had called to the other, “Here I am. Come home to me.” The one that flew over was huge, its great brown wings stretched wide. Its white head seemed preposterously small, stuck on the front of its massive body like an afterthought. 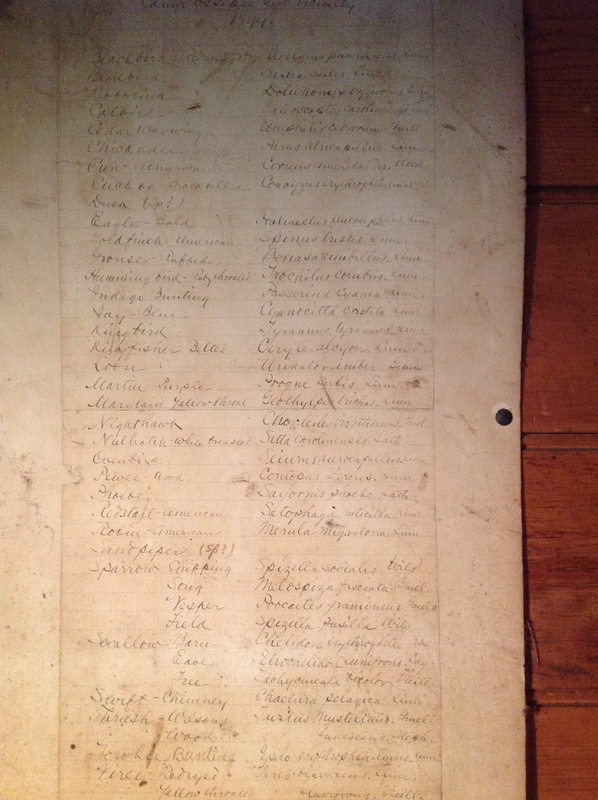 In the camp hall, there is a list from 1899 of the birds that were spotted around the property that year. It is written in a fine, looping hand and is meticulously alphabetized. It has common as well as Latin names, including which taxonomic system the writer used for each – most are Linnaean, but not all. There are four varieties of sparrow and three swallows, two types of woodpecker, bald eagle, phoebe, bobolink, purple martin, kingbird and kingfisher, and many others. I don’t know if all of the birds are still found in this area, and of course there’s no way to verify the accuracy of the list today, but it makes me think about the people as much as the birds that were at camp then. Was it one birder who compiled it? Several? How many bird experts were in that early bunch of campers? Was the list a special project? Or did people just mention their observations over the course of the season, and someone thought to write them down? If we made a bird list today, would it be so long and varied? Or have many of those bird species disappeared from this lake and these woods, victims of climate change, environmental degradation, and habitat loss? Last night, the barred owls called again and again from points all over camp. I’ve heard them almost every night this trip, but this was the most active they had been. I remarked on hearing one when I was sitting in the hall in the late evening. A couple of campers cocked their heads, listening through the open windows, and when it called again, they nodded their satisfaction. No owls appear on the 1899 list. It skips from “ovenbird” to “pewee, wood,” but whether that means no owls were heard is a question to which the answer is lost to time, much like the species that disappear daily today. 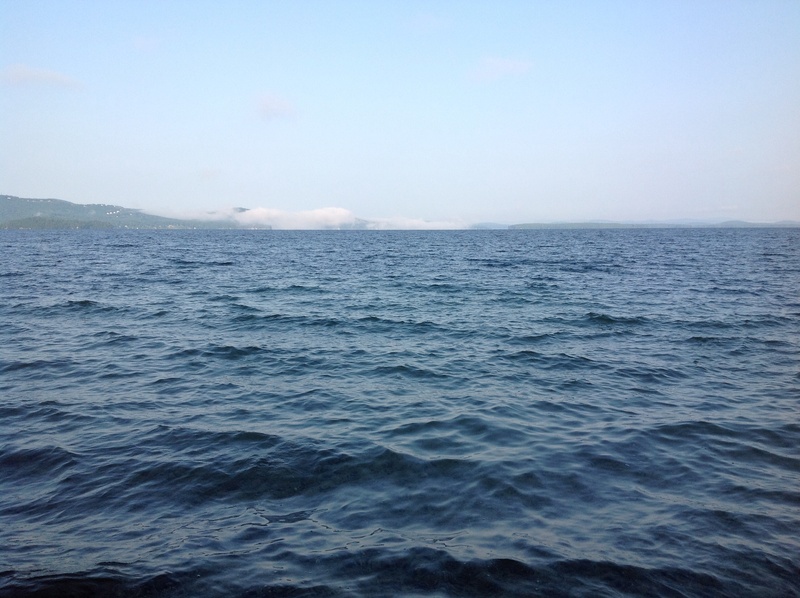 A west wind has blown for the past three days, stirring up strong currents and whitecaps on the lake. Though it has brought waves of rain and made swimming difficult and canoeing doubtful, no one has minded. At camp, winds from the west bring pockets of passing weather, the kind that’s in and out quick. East winds are the ones that we cluck over here. Weather from the east tends to stay a while, socking us in and making us think about whether to take the kids to a museum in town, or maybe head to the Moultonborough Country Store for a dry diversion. So we look at the flag on the dock and see which way the wind blows, and no matter what the weather, if it’s coming from the west, we don’t sweat it. Even in the past three days, there have been periods of sunshine and stunning, scudding cloud formations. There were a couple of strong storms, too, with thunder booming from walls of gunmetal gray clouds. Those have passed over quickly, and the forest in which the camp is nestled is even more green and lush because of the rain. 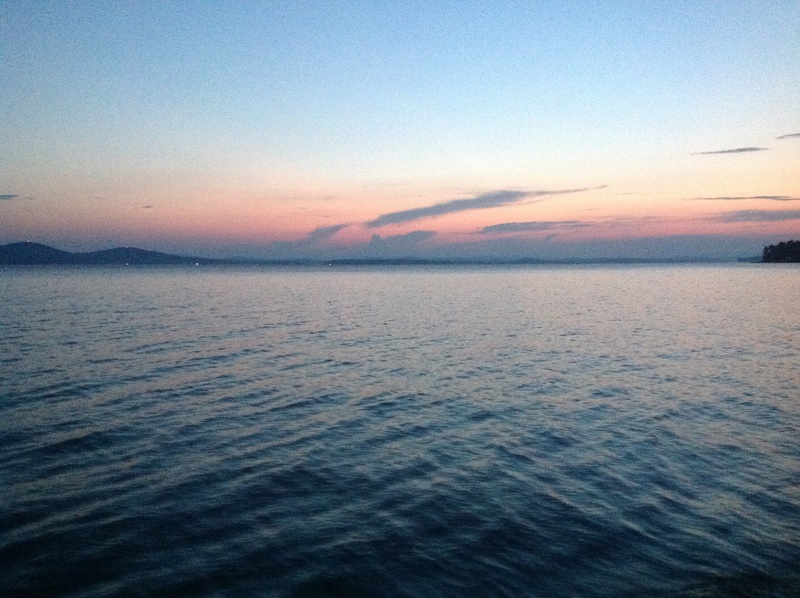 Two evenings ago, after dinner, the west wind died down, and the lake calmed. Before long, though, the flag shifted direction before an east wind. There were thick clouds in the eastern sky. A few of us looked at each other, but someone said hopefully that they had checked the weather, and it’s supposed to be beautiful after another day or so. Others weren’t so sure as the east wind blew. They say in places like the Great Lakes, where we live, and New England, where we visit, that if you don’t like the weather, wait a while, and it’ll change. Sure enough, in the night, the east wind died after a few hours, and the west wind returned, strong and chilly. Our tent faces the lake, which is west on this part of camp’s undulating shoreline, and wind-driven waves pounded the rocks just yards away. The tent canvas rippled and snapped, and the wooden platform creaked. The support poles shivered. Once, last year, an empty tent collapsed in a wind storm. But we’ve had a lot of wind storms here, and that’s the only tent collapse I’ve heard of, so I trust. There’s a lot of trust involved in camp: trust in our tents in all weather, trust that a huge hemlock or pine won’t fall on a tent in the night, trust that the community of campers will work together to overcome challenges. I suppose it’s no different than any significant activity we do in nature, where if we’re honest and smart about it, we acknowledge that we really don’t control a whole lot, so we control what we can, prepare as we ought, and trust that it will be enough. It makes me think about my experiences hiking in the White Mountains. Preparation and judgment are so important there, where weather systems converge and can bring instant winter in the summertime, but deep down, we know that some of the thrill we feel being there is that in the end, getting off the ridges and peaks in one piece partly comes down to luck. Today dawned cool and clear, the west wind still blowing. The mountains across the lake are sharp against the blue sky. A few puffy clouds slide past, and strong currents and whitecaps race by. When the wind ebbs even a little, the warmth of the sun makes adults take off sweatshirts and children jump off the dock, and there’s a sense that maybe the wind will calm to a gentle breeze as the afternoon goes on. And if it doesn’t, with some luck the wind will remain in the west, and no one will mind. 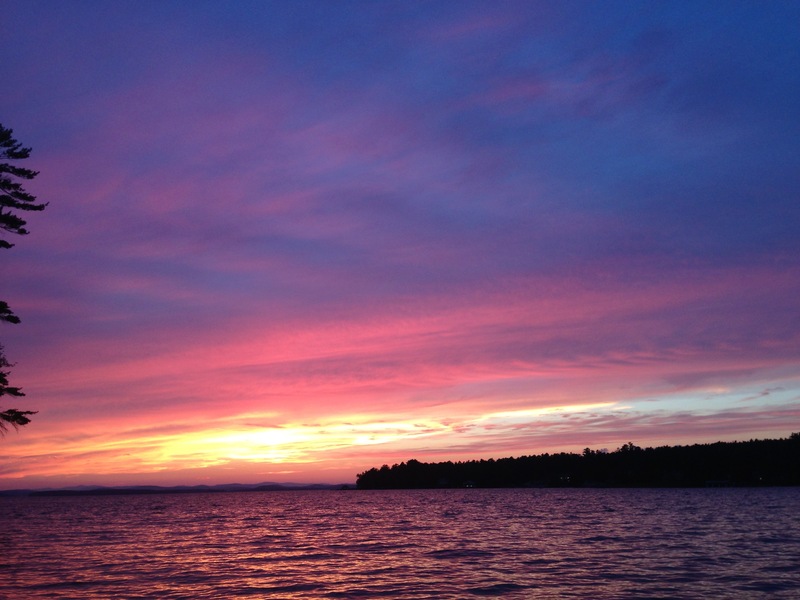 At sunset at our camp on the lake, we gather on the dock to watch the sky turn yellow and pink and orange over the mountains that line the western shore. Clouds become silhouettes surrounded by a golden, electric glow. The eastern sky dims to indigo. After the sun has gone, we leave the still-light dock and slip into the dark woods among the pines and hemlocks and birches. Night falls rapidly in the forest, where shade abounds even at noon. The dusty smell of pine straw rises from the warm ground into the cooling air. Chunky toads speckled with brown and tan, camouflaged against the leaf litter, come out for their evening romp. We are quick with our flashlights, hoping to spy them when we hear them hopping. Or is it the rustle of a field mouse scampering? No, not this time. It was a toad. Tonight, as we watched the sunset, a juvenile bald eagle soared directly over our heads not much higher than the treetops, coming from behind and then veering over the forest. It was dark brownish-gray, the underside of its wings flecked with light gray or white. We debated what it might be. Some sort of hawk? None that we knew. One person noted that its wings were vulture-like, and that tipped my son and me toward the possibility that it was an eagle. A glance in a bird guide quickly settled the discussion. We get bald eagles here. One frequents a tree over the camp beach. A few years ago, two of them perched for a long time directly over the heart of the camp, and someone passing through would have seen a couple dozen of us on our backs on the forest floor, watching the national birds above. The show lasted for more than an hour. With the binoculars that were passed around, I got a better view of the eagles than I had ever had before outside of a sanctuary. Sleek, white heads. Husky, brown bodies. Curved, sharp beaks that were all business. The birds preened and looked majestic – just another day’s work for them. As darkness falls, a few boats run for home with bow and stern lights. At the camp, the hall turns bright as some folks gather to read or chat or play a game. The sturdy, old-school canvas platform tents that we stay in glow white with lantern light. The high buzz of crickets replaces the bird calls that dominate the daytime. As the activity of camp wanes, the sound of the water lapping against the rocks seems to get more prominent. I love falling asleep to that rhythmic sound. It seems almost to rock me back and forth, suspended between sleep and wakefulness, a cocoon of muzziness enveloping my mind. Often, when I awaken for a moment late in the night, I find that the lake sounds have gone, the wind having died. The water has become a luminous sheet outside of our tent. A half-moon heads for the horizon. On the lake, a loon calls, its cry sounding like a breathy, mournful whistle. Three tones, low-high-low, sometimes repeated, perhaps with a monotone call thrown in. A barred owl replies from deep in the woods, eight short hoots divided into two measures of four each. In a few hours, the grey light of dawn will throw the trees into relief against the tent walls. If I’m up, I will think about an early morning dip in the glassy water, long before the breakfast bell rings from the hall. The cool, damp air blowing through my kitchen window smelled of water and cut wood, soil and evergreens, reminiscent of morning at the lakeside camp we go to in New Hampshire. I instantly felt a mix of joy and longing, then thought about the journey ahead to the camp this summer. That journey is fifteen hours by car. At the end, the pavement gives way to gravel, then dirt, and the trees close overhead so suddenly it is as if they snapped shut. We plunge into cooler, shaded air: forest air. The car fills with cries of, “We’re here! We’re here!” And with that, we pass through the old, rust-red gate. The must of the forest, herbal and woody, sharpened with the mineral scent of the lake just yards away, fills my lungs and brings me joy. Stress lifts – the stress of job and home and the daily routine and the long drive. I have reached the place where I am most able to relax. Thoughts of this journey, and the feelings that preceded those thoughts, started when I inhaled the scent of the air gusting through my kitchen window one late spring morning in Michigan. Recently, my family returned from a camping trip to Tahquamenon Falls in Michigan’s Upper Peninsula. As we viewed the upper falls, two hundred feet wide and nearly fifty high, we felt the cool mist prickle against our cheeks. The scent of water was everywhere – in the mist of the falls, in the moist soil by the riverbank, and rising from warm river stones. Even as I was fully present to the impressive and beautiful view of the falls, the scent triggered a surge of anticipation for the New Hampshire trip still to come. I thought about the camp dock, and the beach, and the resin oozing from hemlocks and trapping daddy long-legs that venture into it, looking for a taste. I pictured the rust-red gate and sitting with friends under the trees. I felt almost like I was there. When we arrived back at home from Tahquamenon and spread our wet tent to dry, the scent of the warm fabric took me to previous camping trips, some long past. This time, the emotional trigger of my sense of smell jarred other sensory memories, especially those of night sounds in the woods – a barred owl asking “Who cooks for you?” in a riverine campground close to home, the click-squeak of bats flitting amongst the trees at dusk, footsteps near our tent that sounded like something big wandering in the wee hours but turned out to be a raccoon, rain pattering against the taught fly as a shower passed overhead, the sharp crack of pine logs in a campfire sending sparks flying toward the shadowy treetops. Our sense of smell is both immersive and transporting, because it is a gateway to emotion. The olfactory system connects directly to our limbic system, an emotional center of the brain. The cortex, where much of our cognition happens, comes later in the pathway. When we respond to a scent, feeling precedes thinking. So, I feel joy when exposed to certain odors before I can identify the smells or even name what I associate with them. When that happens, just after the joy first leaps within me, I find that I look around for what I might be smelling, and I think about associations with that smell – sights and sounds and adventures I have had. We collect these sensory experiences as we encounter the world, sorting them, filtering some out, cataloging others. On another recent trip to the Upper Peninsula, my friend and I were nearing our destination in the Les Cheneaux Islands region when a warm, spicy, evergreen smell poured in through the car vents. “Do you smell that?” I asked. “Is that the trees?” He inhaled deeply and then said, “It’s the cedars.” And I knew, as my excitement mounted about reaching our destination, that I would now associate the cedar scent with that place and time and the fun we would have on that trip. I had a similar experience as I took in the rich, fresh scent of balsam fir in the Presidential Range of the White Mountains. Hiking there with a friend a few years ago, I wondered what the smell was. As if he read my mind, he said, “Smell that? It’s balsam fir.” The scent recurred only now and then on the trail, riding sudden wafts of warm air. During that long, challenging day of hiking, I think we both found it invigorating, something we looked forward to as we ascended the rocky trail amongst the trees. A happy smell. A scent that triggers joy and positive associations. The smell of lilacs in the late spring as I walk through the neighborhood. The scents of cut wood and woodsmoke, evoking campfires and winter evenings by the fireplace as snow falls softly beyond the windows. The musty odor of rich, dark soil in a freshly dug garden. The smell of shampoo in my children’s hair as I lean close to kiss them goodnight. The warm smell of my wife’s cheek – I can’t describe it; it’s just her, and I know it. 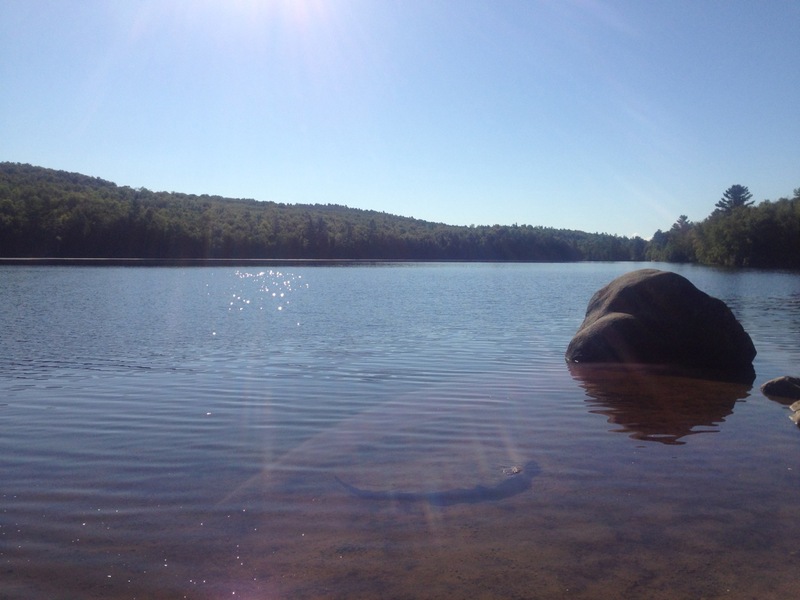 And, of course, the scents of the forest and lake at the camp in New Hampshire. Each of these scents, and so many more, trigger happiness and contentment, or a sense of wonder, or calmness, or longing, or sometimes all of these feelings. And after the feelings come thoughts and memories and yearning. For me, outdoor smells prompt the strongest, most positive feelings and associations. When I am hiking, camping, or even just walking in the woods, I am not stretched thin by stressors great and small, and my time is not in demand. I live more in sync with the rhythms of the day. I am able to relax and attend and explore. And for that time, that span of days or weeks or sometimes mere hours or minutes, I am most open to experiencing the world through the windows of my senses. To camp at Ricker Pond in Vermont, you need a good sleeping pad. The ground is stony, and you can’t clear the smallish cobbles. So get a good pad. Join the talkative loons and numerous chattering brooks and wash of stars in the night sky. Breathe the Green Mountain air. Swim in the clear pond. Forget how hard you worked to get there. Don’t think about the days ahead in the next beautiful place. Just be fully present in this one. All that lies ahead will have its own time soon enough. At Ricker Pond, I was reminded as my son slept next to me that young children travel in their sleep, as if their desire to explore doesn’t stop even when they’ve passed beyond wakefulness. That night, my 8 year old son shifted and turned, ending up by morning twisted in his sleeping bag. My wife and I remained squarely on our pads, as did our daughter, who is 11 and becoming less childlike by the week. The three of us looked orderly lined up in our parallel sleeping bags, while the boy finished the night with his legs across mine and his head in a corner of the tent. But he seemed to sleep well even as dawn came and the forest birds began to sing. As usual on the first night of camping, I slept poorly, but I stopped minding that a few years ago. It gives me a chance to hear where I am. As all else goes quiet — my family, the campground, cars on a nearby road, my mind — the night sounds come alive. On Ricker Pond, the loons howled and laughed from dusk to dawn. Water rushed and trickled in the brooks. The wind whispered in the trees and rustled the fabric of our tent. Small animals scampered past. Nearly sleepless on the first night of camping, I was awake to my own wonder, at my most open and receptive, free to breathe and to listen.